The next big Assassin's Creed game and the first to appear exclusively on next-generation consoles won't let people play as female assassins in a new cooperative multiplayer mode, Ubisoft said this week at E3. Speaking in an interview with Polygon, Unity creative director Alex Amancio said that while they originally planned to include female assassins, the "reality of production" made adding the additional characters too costly. The studio "had to" cut female assassins from the co-op mode, Amancio explained in response to a question from Polygon's Ben Kuchera, because keeping them in would have doubled the cost of pretty much everything: "it's double the animations, double the voices, all that stuff, double the visual assets—especially because we have customizable assassins." As a result, "it was really a lot of extra production work," Amancio continued. "And it's not like we could cut our main character Arno." The developer's explanation struck many Assassin's Creed fans as odd since Ubisoft's popular series of historically-themed open-world murder simulators has featured female assassins in a number of playable and non-playable roles for years now. Since 2010's Brotherhood, players have been able to suit up as female killers in competitive multiplayer modes and enlist female recruits into the team of assassins they amass during single player campaigns. Assassin's Creed: Liberation, a 2012 installment for the PlayStation Vita, even had a women of color in its starring role. And while Amancio highlighted development cost as a deciding factor here, his comments don't jibe so neatly with other stuff Ubisoft has been saying this week about the new game. First, as a next-gen exclusive Assassin's Creed game, Unity is being developed for fewer systems than last year's pirate-themed installment, Black Flag. 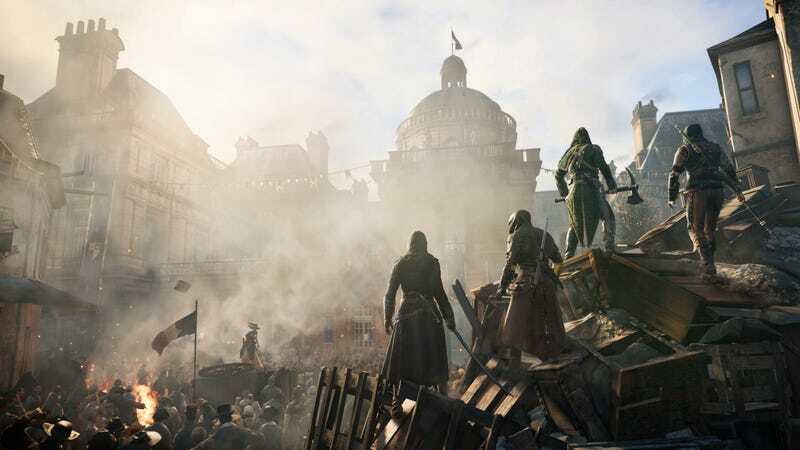 Also, the developers told Kotaku's Stephen Totilo this week that the game's version of French Revolution-era Paris "will be the largest city in the series' history," so Ubisoft has clearly pulled the stops out on other parts of the game's development. Oh, and one more thing: Ubisoft also said that there won't be any competitive multiplayer in Unity—the first time a core Assassin's Creed game hasn't had it since the mode debuted in 2010's Brotherhood. Since the co-op is effectively replacing it as Unity's multiplayer offering, why is rehashing something that already existed in previous titles prohibitively expensive for a spiffy next-gen-only sequel? This is hardly the first time a major game company has waved off including a more diverse set of characters by citing logistical hurdles, however. Earlier this year, another set of Ubisoft developers said that the company won't be introducing gay protagonists any time soon "because of fears that it'll impact sales." Kotaku is still on the ground at E3, so we'll continue to look into this issue as the day progresses. Update 2:30 PM EDT: Ubisoft has issued a response, which you can read here.